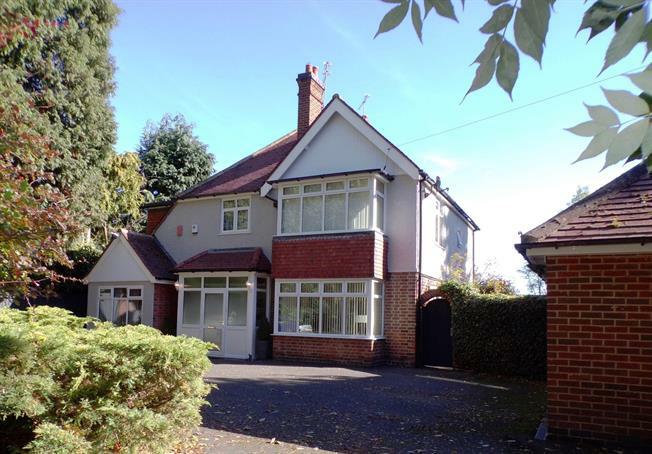 5 Bedroom Detached House For Sale in Wigston for Offers Over £450,000. Spencers are delighted to present to market this much loved and very well presented detached family home. Offering spacious and versatile accommodation which comprises of, impressive entrance hall, generous kitchen, breakfast room, study, large lounge with separate dining space, immense games room with wc and bar area, to the first floor are 5 bedrooms the master having a walk in wardrobe, four piece family bathroom, external stores and pavilion room. Landscaped gardens, detached double garage and private driveway. UPVC double glazed door, opening onto the driveway. Double glazed uPVC window with obscure glass facing the front. UPVC double glazed door. Double glazed uPVC window with obscure glass. Radiator. Double glazed uPVC window facing the rear overlooking the garden. Tiled flooring. Roll top work surface, wall and base units, stainless steel sink, overhead extractor. Double glazed uPVC window facing the front. Radiator, tiled flooring, built-in storage cupboard. Double glazed uPVC box bay window facing the front. Radiator and open fire. UPVC double glazed door, opening onto the patio. Radiator and gas fire. Double glazed uPVC window facing the rear overlooking the garden. Radiator, under stair storage and built-in storage cupboard. UPVC French double glazed door, opening onto the patio. Double aspect double glazed uPVC windows facing the front and side. Radiator. UPVC double glazed door. Low level WC, wash hand basin. Double aspect double glazed uPVC box bay windows facing the front and side. Full with walk in wardrobe with double hanging and shelving. Double aspect double glazed uPVC windows facing the rear and side overlooking the garden. Radiator, a built-in wardrobe. Double aspect double glazed uPVC windows facing the rear and side. Radiator. Single shower enclosure. Single glazed uPVC window with obscure glass facing the rear. Radiator. Low level WC, spa bath with mixer tap, single enclosure shower, wash hand basin with mixer tap. To the front of the property is a large driveway enclosed by timber fencing and gate which leads to the double detached garage and this exclusive family home. There is an established spinney area abundant with mature trees and perennials, side gated access leading to a side garden and patio area, lawn and borders filled with roses. The rear garden is a tremendous size boasting a full width patio area perfect for alfresco dining, a well proportioned lawn with pathway around, wood store, vegetable patch and fruit trees, deep borders filled with mature trees and plants. Two good sized external stores and pavilion room which would make an ideal workshop, studio or annex conversion. Covered side storage and pathway.